It’s commonly advised to keep your refrigerator door closed, or opened for as little time as possible in order to save energy. Some tips include thinking about what you need out of the fridge in advance, or making a list of current groceries and pasting it on a magnet at the door so you know exactly what’s in the fridge before opening it. With the S.Home refrigerator by Changhong, these mental memories can now take a break. 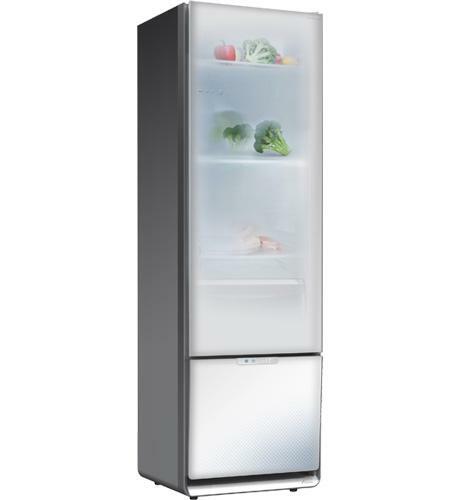 The unique S.Home refrigerator features a design that allows the inside contents to be visible as users approach the white front, decorative frame door made of brushed aluminum and interior lighting. When standing several feet away from the door, the fridge looks like your ordinary appliance and guests won’t be able to peek inside from afar. This technology helps users to see what they need out of the fridge or simply take a glance before making a shopping list without ever having to open the door. The S.Home combines the concept of a glass refrigerator door often found in mini-fridges at bars, but takes privacy and design up a notch. Of course, the idea is not entirely foolproof. If you happen to stack items on top of each other in the freezer, it could be a bit harder to tell what’s behind the doors aside from the very front produce. Still, transparent doors can prevent people from needlessly opening refrigerator doors and may save up to seven percent of electricity costs per year. That’s always an idea we can get behind. It’s unclear whether the China-based Changhong will ever bring the S.Home to international locations or how much this particular model costs but hopefully similar designs will soon be integrated with other home appliances to cut energy wastes.